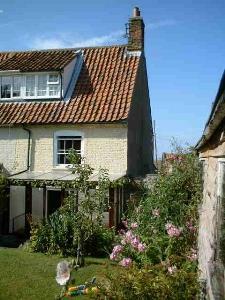 Skylark Cottage01507 603852work Self-cateringVery close to the sea, old beams and wood burning stove. The accommodation is over three floors with two bedrooms, kitchen/sitting room and a conservatory leading onto a sunny enclosed garden. The cottage is tucked away in a quiet location close to Wells Quay and within walking distance of the beach and salt marshes. Ideal location for birdwatchers, walkers and families. Central heating costs included in rent. Sorry, no dogs. Open all year. BOOK and check availability via my website. Very close to the sea, old beams and wood burning stove. The accommodation is over three floors with two bedrooms, kitchen/sitting room and a conservatory leading onto a sunny enclosed garden. The cottage is tucked away in a quiet location close to Wells Quay and within walking distance of the beach and salt marshes. Ideal location for birdwatchers, walkers and families. Central heating costs included in rent. Sorry, no dogs. Open all year. BOOK and check availability via my website. Skylark Cottage is an old cottage with a winding staircase. The WC is on the first floor and there are steps up into the garden. Unfortunately, it is not suitable for wheelchair users.